In as fascinating a story as the novels themselves, James Bond has his very roots in Jamaica. Not only were all 13 James Bond novels written in Jamaica, but author Ian Fleming was himself enchanted by the island and called Jamaica his home. Ian Lancaster Fleming of the British Naval Intelligence first laid eyes on Jamaica during World War II, while on a mission to investigate U-boat activities in the Caribbean. Though only a brief encounter, Fleming fell in love with Jamaica and vowed to spend the rest of his life here. 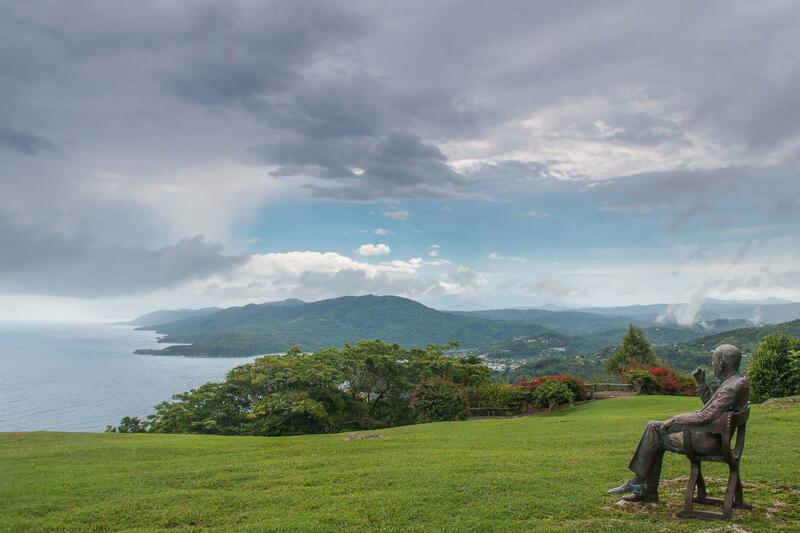 In 1946 he purchased 15 acres of land, formerly a donkey race-track, overlooking a small cove in Oracabessa, just 20 minutes from the resort town of Ocho Rios. He built his home and named it GoldenEye after a secret WWII mission. In the quiet countryside district of Oracabessa, St. Mary, Fleming was soon to have a famous neighbour, noted playwright Noel Coward. While Fleming would travel to GoldenEye every winter to write, he rented the property to Coward, who for the spring of 1948 rented GoldenEye (which Coward quickly renamed to “GoldenEye, nose and throat” because of the humid tropical climate) for £50 a week. After increasing visits from his prominent friends, Coward built his own Jamaican retreat, Firefly, just a few miles east of GoldenEye. On March 24, 1952 at the Port Maria Town Hall, Ian Fleming married his long time love Anne Rothermore. They settled into GoldenEye, where Ian penned all 13 Bond novels from the writing desk of his bedroom. He drew inspiration from his experience in the Naval Intelligence as well as his surroundings in Jamaica, often in his journals & novels describing in rich detail the lush Jamaican landscape and the marine life of his private cove. As a lover of flora and fauna, one of his self proclaimed bibles was Birds of the West Indies, written by American ornithologist James Bond, whose name he borrowed to create his well-loved character. Readers of Live and Let Die, Dr. No and The Man with the Golden Gun have all been transported to Jamaica as the setting of scenes from the novels. The very first 007 film ‘Dr. No’ was partly filmed on location in St. Mary and Kingston Jamaica in 1961. 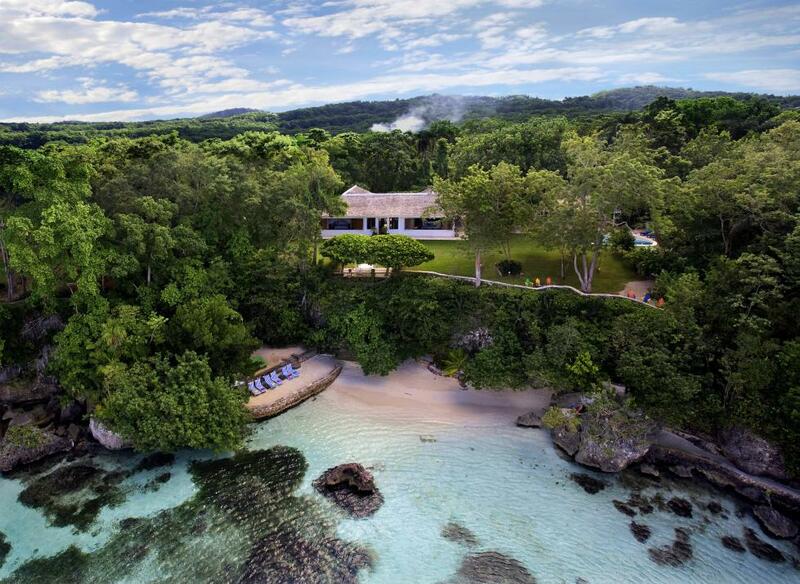 Chris Blackwell, founder of Island Records and now owner of the GoldenEye estate, was hired as the location scout for the film in which the scene to become most famously linked with Jamaica debuted in 1962. He selected what is now Laughing Waters, the spot where Ursula Andress famously emerges from the ocean, clad in the iconic white swimsuit, conch shell in hand. Fleming’s love for Jamaica continued till his passing in 1964. 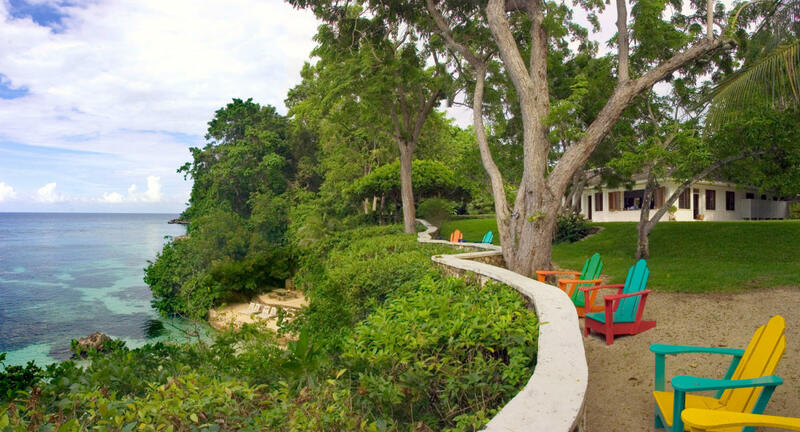 Since then his adored Jamaican home continues to welcome actors, actresses and the like who sojourn to Jamaica for the similar seclusion and beauty that inspired Fleming’s legacy of literature. Now an Island Outpost property, GoldenEye Hotel & Resort sits on the original piece of land as well as 40 neighbouring acres. This exclusive cliff top hideaway gives guests a chance to live out their Bond dreams with a stay inside Ian Fleming’s very own villa. From the same writing desk the beauty of Jamaica continues to captivate guests, continuing the love affair that gave the world Bond… James Bond.